Stay up-to-date on what's happening in Athletics! Learn more about the new 11-acre athletic complex! An intentional culture of love, service, personal and collective responsibility creates a distinct community and enduring interconnectedness. The Wall of Fame honors those who have been instrumental in the overall development of the University's athletics program. With the addition of indoor and outdoor men's and women's track and field, Scranton sponsors 23 NCAA Division III (non-scholarship) athletic programs – 10 for men and 11 for women. The University is a member of the Landmark Conference in 22 of the 23 sports it sponsors. The wrestling team competes as an independent. 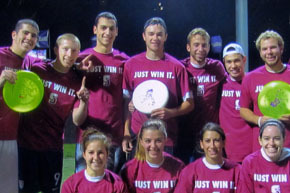 In addition, more than 1,500 students are involved in recreational sports and intramurals, including leagues, tournaments and weekend special events. Through participation in Division III athletics, our student-athletes pursue academic excellence, refine athletic skills, demonstrate leadership, engage in good sportsmanship and serve others. 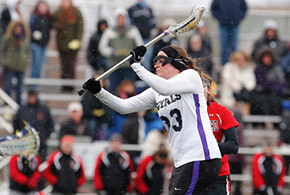 Scranton students are active — more than 1,600 are involved in recreational sports and intramurals. With 18 intramural sports, 14 club sports and our 14,000-square-foot fitness center, you’ll find plenty of ways to stay competitive and fit. 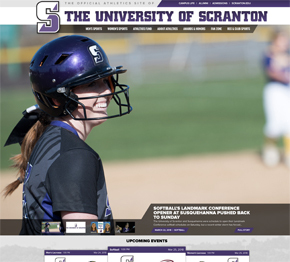 The University provides information – schedules, rosters, news, statistics and more – on its 22 intercollegiate athletics teams and the athletics department on the official athletics website. Follow your favorite team, get updates on student-athletes and find out about the University’s athletic accomplishments all on the athletics website.